Mumbai is undoubtedly a fascinating place and in its very neighborhood, you have a more than charming hill station known as Mahabaleshwar. For newly weds, honeymoon in Mahabaleshwar is certainly an exciting thing to have. With nice historical inheritance, this place shows you amazing temples and forts. And nature lovers spot a series of mesmerizing waterfalls to tickle their fancy. Your Mahabaleshwar honeymoon packages also take you under the beautiful unexplored caves and you also get the wonderful chances of heading towards the hilly and mountain regions as well as tall points from where the surrounding beautiful natural scenes can be easily viewed. During your Mahabaleshwar honeymoon tours, you can easily experience the entire picturesque aspect associated with Mahabaleshwar that is a true fancy tickler for honeymooners. The plenty of tourist attractions adorning Mahabaleshwar give you more than one reason to make the most of your Mahabaleshwar tours. You can start your honeymoon in Mahabaleshwar by staring lovingly at each other while standing near the breathtaking waterfalls such as Chinaman’s Waterfall, Lingmala Waterfall as well as Dhobi Waterfall. The beautiful Lingmala Waterfall, lying in the proximity of the Venna Valley provides you with an enchanting sight of the shiny water wonderfully falling down. The Dhobi Waterfall lies close to the calm Koyna River and is a much frequented attraction, mainly by the newly weds. These waterfalls are also considered to be amazing picnic spots and are treated as significant attractions included in your Mahabaleswar honeymoon packages. And if you both want to be amidst the sheer charm of nature all around you, including the views of sunsets, various fields as well as deep valleys, then Mahabaleshwar has various points awaiting you during your Mahabaleshwar honeymoon tours. You both can head towards the Babington Point, which unveils the enchanting view of the Koyna Valley to you along with the sight of the Chinaman’s Waterfall. Wilson Point, regarded as Mahabaleshwar’s highest point, which captivates your attention through its sunrise that is nicely visible fro here. Bombay Point is another point that deserves your visit and tickles your fancy through the sight of magnificent Pratapgarh and Makrandgarh peaks. Apart from the above mentioned points, you can also steer your way towards the Elphinstone Point that enchants you with views of the Savitri and Koyana Valleys. Moreover, Lodwick Point and Galoni Point are other points deserving your visit during your Honeymoon in India and they are more than enough to boggle your minds completely. From Lodwick Point, you can have the alluring sight of the adjoining forests and from the Galoni Point, the view of the valleys is a treat for your eyes. Other spots in the list of the attractions of Mahabaleshwar include the Pratapgarh Fort, which has the historical associations of Shivaji Maharaja of the 17th century attached to it. After visit this spot, you both can head towards the Arthur’s Seat, which got its name from Arthur Malet, a well known British actor. This spot is considered to be exceedingly interesting since from here the sights of the Savitri and Jor Valleys can be nicely viewed. 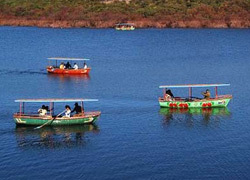 All these attractions are a very important part of your Mahabaleshwar Holiday Packages for Honeymoon. So, do make it a point to come to Mahabaleshwar for your honeymoon. Arrival in Mumbai and transfer to hotel. After refreshing, proceed for a tour to Elephanta Island. Here are located the world famous Elephanta Caves carved out of rocks. The island is thickly covered with palm, tamarind and mango trees. A full day Mumbai Darshan. Places to visit: Mahalaxmi Temple, Hanging Garden, Kamla Nehru Park, Boot House, Girgaon Chowpatty, Nehru Planetarium, Gateway of India, Jogger’s Park, Juhu Beach etc. On the third day of your honeymoon trip in Maharashtra, proceed to Mahabaleshwar. Distance between Mahabaleshwar is 250kms approx and it takes around 5 hrs to there. Spend two days of your honeymoon trip in the romantic ambience of Mahabaleshwar. Mahabalshwar is a marvelous hill station located in the state of Maharashtra in India. Mahabaleshwar is the favorite weekend destination for Mumbaites and other Maharashtrians as it is away from the hustle and bustle. Landscape of Mahabaleshwar consists of flat-topped ghats, dense forests and lush green valley. Places to visit in Mahabaleshwar: Echo Point, Mapro Garden, Strawberry Garden, Kates Point, Needle Point and Hunter Point,Mount Malcolm, Catholic Church, Mahabaleshwar club, Morarji Castle, Pratapgad Fort, Lodwick Point, Elphinstone Point, Dhobi waterfall, Krishna and Mahabaleshwar Temples, Lingmala waterfall, view point of the five rivers-Krishana, Koyana, Savitri, Veena and Gayatri. Overnight at hotel in Mahabaleshwar. After breakfast leave for a full day trip to Panchgani, a hill resort 19 kms from Mahabaleshwar. Panchgani hill station is so called as it is surrounded by five hills. Panchgani is a well known hill station in Maharashtra famous for trekking and other adventure activities. Table Land-flat mountain top and berry farms of Panchgani are fascinating. Transfer to Mumbai airport/railway station for your onward journey. Tour concludes.